Stomach acid is your friend… and acid suppressing drugs are part of the problem! Digestion begins as soon as food enters our mouth. As we chew our food into more digestible sizes we release salivary amylase to help us break down starches. The chewed food then travels down the esophagus to the stomach, and it is here that many people begin to have problems such as acid reflux and nausea. The most common cause of these problems might surprise you: low stomach acid! Low stomach acid is prevalent and can lead to many complications including acid reflux, smelly gas, constipation and hives. However, much of the US population is wreaking havoc on the stomache’s ability to digest by taking acid suppressing drugs and over the counter antacids, instead of fixing the root of the problem. 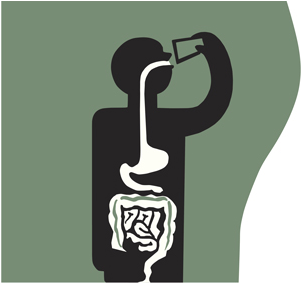 What kind of complications can you expect from low stomach acid? Poor stomach acid leads to acid reflux, sour stomach, difficulty digesting protein, nausea, burping, constipation and smelly gas! That’s right, acid reflux is most often a symptom of a stomach that does not have enough acid, not the other way around. Taking antacids may temporarily stop the symptoms, but sets the stage for it to happen again, and again, and again. Also, with low stomach acid you can’t absorb minerals like calcium, iron, magnesium, copper, zinc, as well as vitamin C, K and B complexes! It is not uncommon to have nutritional deficiency simply because you have low stomach acid. If that wasn’t enough, low stomach acidity can lead to hives and lowered immunity! Our stomach needs to be very acidic, between a PH of 1-2, to have optimal function. One of the major functions of stomach acid is to digest protein. If you don’t have enough acid then protein will not digest properly, but putrefy and rot in your stomach, splashing up to burn your esophagus. The two sphincters of your stomach, which protect the esophagus and allow food to move on, are triggered by an acidic stomach and won’t function properly on a stomach low in acid. This means that food will move slower though your stomach and there won’t be an upper door to keep the rotting food from splashing up and causing heartburn. Then, the undigested proteins will continue to rot throughout your digestive track and act as the primary cause of smelly gas! Why do we get low stomach acid? Our stomach stops producing acid when under stress. When we are stressed out our body is in fight or flight (sympathetic dominance). In this state our body prioritizes bursts of energy over digestion. When our ancestors needed to run from wild animals, digestion was shut down and all energy devoted to running as fast as possible. Maybe we aren’t fighting wild boars or saber toothed tigers on a daily basis, but we are constantly under stress from our work, difficult home life and excessive lifestyles. Our body needs to be in rest and digest (parasympathetic dominance) as often as possible, and save the fight or flight mode for real emergencies. Stress can be emotional stress, but also can be stress caused by poor diet or over working your body. The biggest dietary stress on our body is sugar. Sugar is the root of many modern diseases including heart disease, obesity, diabetes and Alzheimers, and fluctuations of blood sugar are very hard on our body. Also, stomach acid naturally becomes less and less as we age, and it is necessary to supplement in many elderly people. One thing we can do immediately is to eat appropriately sized meals. Our stomach, when functioning properly, produces enough acid to coat about a fist size of food (our own fist). Any meal that is larger than that creates the problem of not having enough acid to go around. Drinking water during meals can also dilute stomach acid, so a general rule is to not drink fluids with big meals. Instead, get your thirst quenched at least a half hour before meals, and at least an hour after. In addition, reducing stress is key, and we should especially not be stressed when we are eating. Try acupuncture, meditation, belly breathing exercises, yoga, or a gentle walk to reduce stress. Apple cider vinegar is a fantastic digestive aid and used to be the go to home remedy for acid reflux. You can take a tablespoon of slightly diluted apple cider vinegar 10 minutes before each meal for best results, or as needed when you are having symptoms such as acid reflux and nausea. Ginger, which is regularly used in Chinese herbalism, has a wide range of digestive health benefits and is well known for its ability to reduce nausea and temporary stomach upset. Ginger promotes gastric acid secretion, which is why it is often used together with the consumption of seafood. Higher quality of stomach acid protects us from possible contamination of our food, and ginger has been used in many cultures to help prevent seafood poisoning. Ginger is also mucoprotective (promotes the health of the mucous membrane of the stomach lining), promotes normal bile flow (which is essential in digesting fats), and supports gastrointestinal motility (for those with a sluggish bowel). When things are really bad, the best way to solve the problem is to add acid back into your body in the form of betaine hydrochloride (HCL) (we often suggest a product called Zypan by Standard Process which contains HCL and enzymes). By supplementing your stomach acid, you create a positive feedback reaction and your stomach starts producing more acid on its own. Supplementation with a good high quality betaine hydrochloride is the most effective way to correct low acidity. Much of this used to be common knowledge. Your great-grandma may have told you to take a tablespoon of apple cider vinegar when you had indigestion or to have a warm glass of ginger tea when you felt nauseous, and the main remedy for hives not too long ago was to supplement with hydrochloric acid (HCL). These days unfortunately, the most common treatment is to reduce the acidity to such a low amount that when it splashes up it won’t burn. Unfortunately, as we have seen, this can lead to many more health complications and in no way solves the actual problem! ← Connecting With Your Local Food Source!